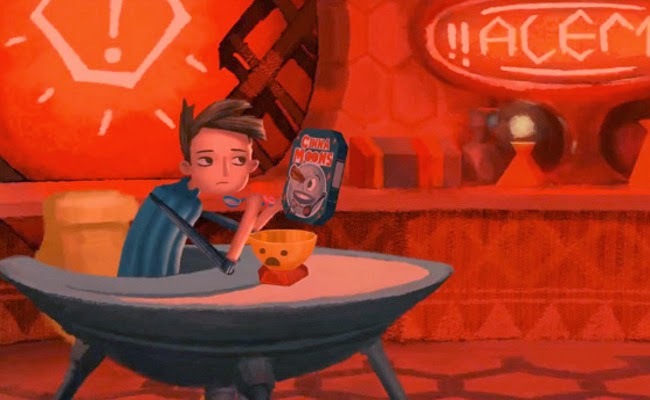 This week at PopMatters, I finally get around to writing about Broken Age. As I discussed in our podcast, I appreciate the way Broken Age draws you into the story through its puzzles. They are all appropriately zany for an adventure game, but they do a good job of conveying the absuridty of Shay and Vella's situations. Shay lives a life defined by boring repetition, and you are made to felt that through the easy puzzles early on. Vella's world is filled with people who think that sacrificing people to a monster is normal, so the mundane tasks that make up the puzzles communicate the weird combination of violence and boredom that defines her culture. I didn't get a chance to include it in the column, but I particularly liked the gendered nature of Vella's story. In her world, the greatest honor for a girl is to get dolled up and then consumed by a monster. It's a nice metaphor for the cultural pressures imposed on women and the overall commodification of femininity. It also is a nice juxtaposition to Shay's story, which focuses on a young boy whose arc propels him towards becoming a hero. Shay's problem is a lack of danger, while Vella's is the presence of it. All this is to say that I highly recommend playing Broken Age. The puzzles are very reminiscent of classic adventure games without being overly obscure or cumbersome for people who aren't huge fans of the genre. When they are get tedious or strange, there is always a narrative reason. The best way to understand the status quo that Shay and Vella are struggling against is to experience it yourself.